It's the “season premiere” of one of last year's Pilot Season winners! You voted for it, you got it! 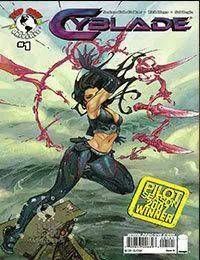 From the pages of Marc Silvestri's Cyberforce comes a solo series for Cyblade!Set in the days before she joined Cyberforce, Dominique Thiebaut has been leading a double life. By day she's an awkward teenager, but at night, a chip in her brain changes her into the deadly master assassin Cyblade. With the ability to create psychic blades of energy, she's an expert in everything from thieving to assassination, performing industrial espionage for the seemingly benevolent Cyberdata corporation. But with the help of a spy sent to infiltrate the company, Cyblade has broken free from Cyberdata's control. She must find a way to escape from their clutches for good, all the while trying to discover who she really is beneath.